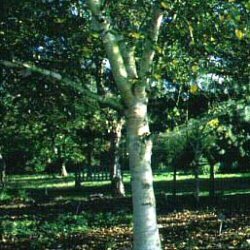 Another stunning pure white-barked birch, Polar Bear Ermins Birch has the additional attraction that its dark green leaves turn glorious shades of yellow in autumn. With its white bark, this trees is a focus of attraction during winter. and it has been commented that it starts to resemble the polar bear of its name. Be that as it may, in spring, attractive yellowish-brown catkins form. This birch is able to cope with most soils and will even tolerate the more exposed gardens. This tree is supplied at a height of between 1.5 and 1.7 metres in a 12 litre container for year round planting and better results than from either bare-root or rootballed stock. Expect a final height of 24m (80ft).